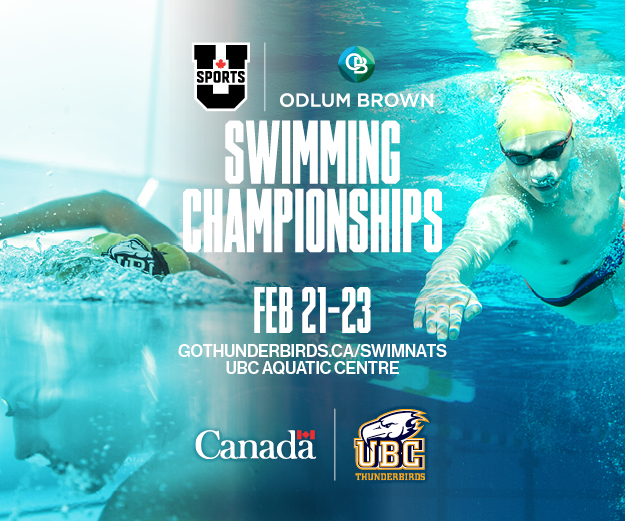 UBC is proud to be hosting the 2019 U SPORTS Odlum Brown Swimming Championships taking place at the UBC Aquatic Centre February 21-23, 2019. Cheer on the highly competitive UBC Thunderbird Swim team, (which includes Olympians and Canadian National team swimmers), as they compete on home turf for national championship titles, as well as catch other top swimmers from universities across Canada. Fans may purchase individual tickets to attend the Finals for each day of Championship competition, or a full Championship Pass that includes all three days of the Championship Finals. Spectators also have the option to attend preliminary morning session races (starting at 10am) free of charge, on a first-come-first-served basis and by donation, however anyone wishing to attend the finals each day (evening sessions starting at 6pm) must purchase a ticket. Please check gothunderbirds.ca/swimnats for the full schedule, ticket pricing and link to buy tickets.